Fujifilm just keeps on churning out lenses to fill out its two-year old X-Series system. This rate of production is outstanding on its own, but what is most amazing is the catering to the enthusiast. In just two years, Fuji has managed to create a nearly complete enthusiast lens lineup. The only things missing now are super-fast zooms, supertelephotos and the specialty lenses such as tilt-shift lenses. The latest offering from Fujifilm brings a true ultra-wide-angle zoom to the system in the XF 10-24mm f/4 R OIS. This lens covers a wide range from the extreme wide-angle to the more moderate wide angle, with a field of view equivalent to 15-36mm on a full-frame camera. Not only have they created a useful range, but they’ve thrown in an optical stabilizer to boot. It’s not a cheap lens, at $999, but let’s dive into this Fuji 10-24mm review to see if it’s worth the cost. The 10-24mm f/4 is a constant aperture ultra-wide zoom that has to cover an APS-C sensor and contains an IS unit. As you might imagine, this does make it rather difficult to keep the size down. 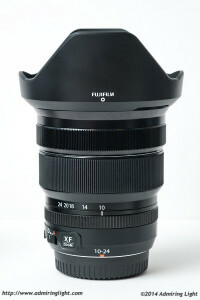 As a result, the 10-24mm is a relatively large lens. Compared to many other mirrorless lenses, it’s downright huge. However, I honestly thought it looked larger in photos than it felt on the camera and in my hand. The lens has a large 72mm front filter ring, though the rest of the lens slims down considerably. As a result, it’s a relatively lightweight lens despite its size, and when used with my X-E2 with the accessory grip, it felt great on the camera. 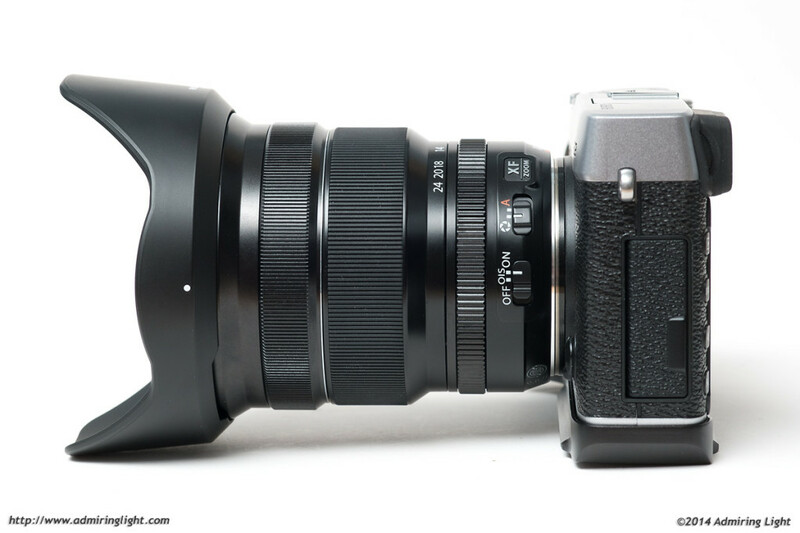 I’d imagine it would handle beautifully on the X-T1 as well. The lens felt slightly awkward on a very small body such as my X-M1, as the weight distribution is just a bit out of whack on a body that small. 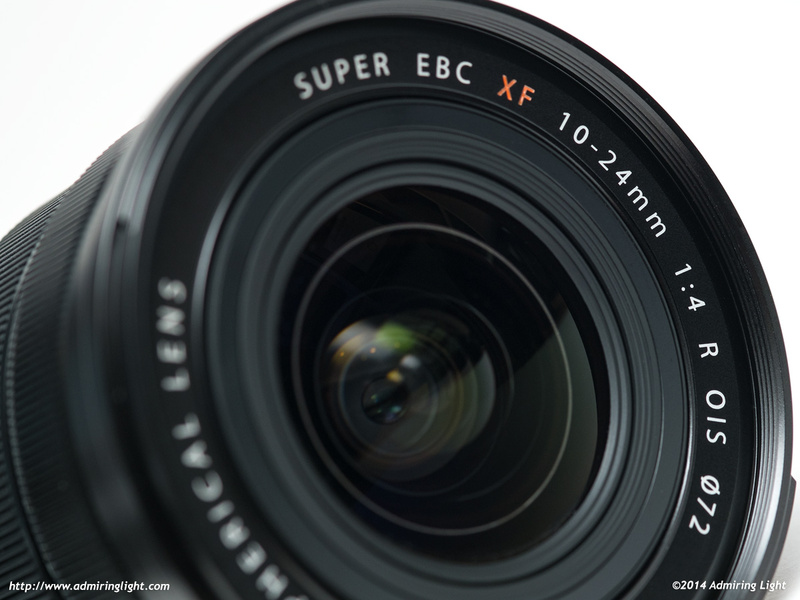 Despite the light weight, the 10-24mm f/4 is built very solidly. The majority of the lens body is made of aluminum and there is no flex anywhere on the lens. The large rubberized zoom ring is well damped and moves smoothly, though I felt the throw on the zoom was a little shorter than I’d like. The metal focus ring is well damped and silky smooth. One oddity about the 10-24mm is that it features the same unmarked and free spinning aperture ring as the 18-55mm f/2.8-4 and the 55-200mm f/3.5-4.8. Since the 10-24mm has a constant f/4 maximum aperture, there is absolutely no reason a marked aperture ring couldn’t have been put in this lens, as it is on all the Fuji prime lenses. This is simply a bizarre design choice. I’d love to have the convenience of seeing my working aperture prior to turning the camera on. The lens comes with a broad petal shaped lens hood that provides decent coverage for the front element and is reversible for storage. The 10-24mm features a very quiet and quite quick focus motor that is, like all the other Fuji lenses, very accurate as well. Focus in almost any normal shooting circumstance was very quick and sure. However, as light levels dim, you definitely need a high-contrast target on which to focus. Without a suitably contrasty target, I found the 10-24mm to occasionally give up without finding focus in low light. The lens can focus all the way down to 0.24m, allowing for tight framing at the long end of the zoom and lots of creative freedom at the wide end. The optical stabilizer in the 10-24mm is effective for about an extra two to three stops of handholdability. I found I could get sharp shots at about 1/4 second at the wide end and at around 1/10 second at the long end in most situations. While this is a decent performance, it’s not quite as impressive as the outstanding stabilizer in the Fuji 55-200mm lens. I did find that if I could properly brace my arms against something rigid, I could get outstanding performance out of the stabilizer, with shots approaching one second at the wide end of the zoom range. I find heavy barrel distortion in the first photo and so I found on many other photos on other posts. The only reason I am holding back my purchase of this lens is that I have Canon 10-22mm which has much lower barrel distortion than this lens and as per my knowledge, it has the lowest distortion amongst all superwide lenses available in the world in this focal length range. Also, you no where mentioned whether in-camera correction (or correction in post processing) was applied or not. Fujifilm corrects distortion in-camera which keeps you from knowing the real distortion level of the lens. Where are you seeing heavy barrel distortion in the first photo? There is heavy PERSPECTIVE distortion, which causes the verticals to converge due to the angle of the camera in the scene, but this is a function of camera position and not the optical characteristics of the lens. Look at the last two images and see how straight the vertical lines are. Heavy barrel distortion would cause those vertical lines to bow from the center out. There is a tiny bit that’s perceptible, but it’s quite a small amount for a UWA zoom. All of these images were processed from RAW, mostly in Lightroom. Lightroom can apply distortion correction, though I’m not sure if it does it for Fuji lenses. However, C1 Pro doesn’t apply corrections (to my knowledge), and the images look the same to my eye in C1. As per imatest, the distortion at 10mm on this lens is 5.03% and on my Canon 10-22mm, it is around 1.25%. Just FYI; I know this is an older review and this particular query may have been sorted by now, but C1 Pro does actually automatically apply corrections. At least on my version (8). While I have yet to use this lens personally, if you take a look at the review over on Lenstip, they show comparisons of raw and jpeg distortion, and the distortion in the raw files is significant. I don’t use Lightroom anymore, but I’ve read you can’t turn off distortion correction that is being applied due to information imbedded in the raw files. In C1, you can. I think it’s important to recognize this type of thing going forward with lenses, as more and more often manufacturers are relying on software to fix what would otherwise be a more difficult manufacturing task. While I’m generally okay with this philosophy, many aren’t, and certainly an argument can be made that to pay so much for an instrument that in itself is poorly corrected is a bit hard to swallow. That all said, I’m excited to receive my copy of the lens (I just ordered it) and enjoy its merits, through software or otherwise. How would you rate this lens in comparison to the 14mm? I’m still not decided yet – the flexibility and wider focal length of the zoom vs. the smaller dimension, and probably slightly(?) better image quality of the fixed one. Hi Jordan, since you have reviewed both the Panasonic 7-14 and this Fuji 10-24, is it possible that you give some comment about these two UW lenses. I have a lot more experience with the 7-14, as I owned it for about 2-3 years, while the 10-24 I only had for a week when I had my review sample. Both are excellent lenses. The 10-24 is a significantly large lens and has optical stabilization, so that may make a difference, unless you’re shooting the 7-14 on an Olympus body. The 7-14 on the E-M5 (not sure if it’s this way on the E-M10 or E-M1) can produce some odd purple flares, which is something to be aware of. Both are very sharp throughout. The 7-14 might better at the long end than the 10-24, but the 10-24 is probably a little better at the wide end. It’s really hard to pick between, considering the different formats and the total image quality is tied to the camera a bit as well. If I’m remembering correctly, the 10-24 controls CA a bit better overall. Both are very sharp. If I had to pick, I’d guess the 10-24 is probably the slightly better lens overall, but it would be very close, and again, that’s with the caveat of only having used the 10-24 for a week. The Fujifilm lens has far too much distortion compared to the Panasonic. Where do you get your info? Just curious. In comparing technical reviews from 2 sites, photozone and lenstip (lenstip is one of the best technical lens review sites, but they didn’t have a review for both lenses), the distortion (speaking geometrically) is worse on the Panasonic. Not too much worse; the Fuji runs around -4.62% and the Panasonic clocks in at -5.24% (at the wide end of course). However, vignetting is worse on the Fuji to be sure, with the Fuji putting in a pretty much abysmal showing at -1.93ev, with the Panasonic tossing in a much more respectable -1.2ev. Fuji does a little better with CA, except at small apertures at the 24mm setting (a bit odd). 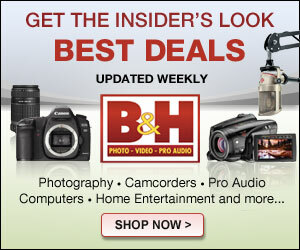 At any rate, it seems to me that the Fuji and Panasonic are in pretty close company as it relates to distortion. Thank you so much for your reply. Good to know either choice will be a good one. As for 7-14 on EM1, Cameralab did a test on that combo and the result is discouraging. So Olympus body may not correct Panasonic lens after all. Anyway, really appreciated your reply and I enjoyed your reviews a lot. Very user oriented. We’ll done. With thin filters, is it possible to stack a CPL and ND on the 10-24 without vignetting? I use the combination with waterfall images on my 16-35 to blur the water and saturate the color (and typically avoid the sky). Amazing images and review! Thank you!